In Whyalla today we spent some time soaking in the details of Hummock Hill where in February 1942 the 26th Heavy Anti Aircraft Battery installed four 3.7 inch AA guns. The majority of steel produced in Australia during World War Two was made from ore mined at Iron Knob nearby and Australia’s defense capacity depended on a single conveyor belt on Whyalla’s Number One iron ore loading jetty, so I guess a few guns are justified.Between October 1941 and August 1945 some 750,000 25-pound HE shell cases were manufactured. The plant also produced 4,100 fighter aircraft engine cylinders. Other measures in the town during the war included black outs, sandbagging and air raid shelters built. What immediately strikes you about Whyalla is the red stain the whole area posses due to the red ore that is processed here, everything has a penetrating ore color. If it is not stained red its painted ore red to match. We took the 10km detour to Lucky Bay in hope of seeing the ferry and as luck would have it when we arrived it was boarding, we watched it departing while enjoying lunch. We spent the night at Louth Bay camp area, $5 per night, right on beach… perfect. This morning we took a look around Coober Pedy, and visited the ‘Old Timers Mine’ which contained a hand dug mine, museum and typical underground house. Mining with pick and shovel in these hard grounds sounds like too much back breaking work for me. One things for sure, there is no grass in Coober, just lots of dust and holes dug everywhere. It is a sight to behold as you drive along the highway with thousands of mounds of dirt and mine holes to match. We stopped at Lake Hart a huge salt lake right next to the Trans Australian Railway line. It was quite amazing to see, touch and walk on this massive salt plain, one of many in the area. This morning we took the van for its photo shoot with the Uluru backdrop before making tracks down the Stuart Hwy back into South Australia. We made it all the way to Coober Pedy today, but after discovering our selected campsite just out of town was down a heavily corrugated dirt road we found ourselves camped at the ‘Big Truck’ on the highway across the road from the Coober Pedy township. After waiting at the rock watching the sun rise it was apparent that the rock would not be open today, the gusts of wind blew with enough force for it to make sense I guess, but I was still disappointed. After sunrise we headed off to The Olgas, or Kata Tjuta (Men’s Sacred Area). Here we headed off on the Valley of the Winds walk which is made up of three sections, 1hr, 2hr and 3hr walks. We both walked to the first lookout, and I continued to the second, and by this time it was already quite hot and I found the return trip, even though it was mostly down hill, very exhausting – but well worth the effort. Today we are heading to Ayers Rock. It is only about 300km and all bitumen so it should be fairly easy going. After a quick refueling stop at Kings Creek (again a hefty $1.95/litre) we continued along the road. It wasn’t long before we saw 3 camels in the same area we saw them last night on the edge of the road. About 100metres further a pack of wild horses bolted across the road in front of us, and then another lot another few hundred meters away. We never have the video camera running when we need it! We reached the Lacester highway intersection at about 12 o’clock. 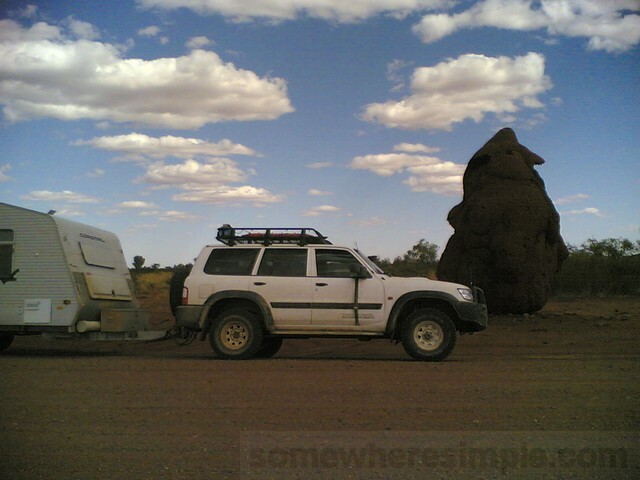 A quick stop to get some more water from the van and then it was a right turn on towards Ayers rock. Not far up this road on the left hand side in the distance you can see glimpses of a huge rock formation. Then there is a lookout for it not much further along – Mt Connor. From the lookout you can walk up over a sand dune on the other side of the road and get an amazing view of a huge salt pan. Note for future – don’t attempt to walk in the red sand with thongs on….I think my toes have sustained third degree burns! There are roadwork’s being conducted on this road and there is that much red dust flying around everywhere that you can’t see 10 meters in front of you! I am surprised at the little amount of wildlife we have seen on our trip. Apart from farming animals, a few lizards, birds and the wild horses and camels from yesterday we really haven’t seen anything. Can’t say I blame them for not living in this heat! All the vegetation is a lot greener than what I was expecting though. Given that it is too damn hot for us to do the Rim walk around the canyon today we decided to go for a bit of 4WDing. We stopped in at the Mobil service station at the KC resort to pick up some fuel (ridiculously priced at $1.95/litre) and purchase our Mereenie Tour Pass for $2.20 which contains our permit allowing us to drive the Mereenie Loop Road as it is within Aboriginal Land. The road is recommended for 4WD only – it was very corrugated but overall not too bad. Not one that we would take the van though! We didn’t see anything that interested us too much (apart from an unusual tree) until we got to the Finke Gorge National Park area. This is where the real 4WDing began and so too the more interesting things to see! We followed a track for about 18km into Palm Valley. This was a spectacular drive along dried up river beds on sand and stone and all sorts of terrain. It was interesting to see all the sections of rock where previous vehicles had scraped and cut sections out of the rock, like those marks you see on nasty speed bumps unwary drivers create. Thankfully the Patrol had no such problems. After Palm Valley we continued returned to the Mereenie Loop before turning off to follow the track to Boggy Hole. This trek though the National Park varies from twisting sand tracks, large sections of river rock to rugged rock hopping, quite an interesting drive. The loop and park trip took us a lot longer than expected and we found ourselves tackling that annoying 30km stretch of corrugations on Ernest Giles Road again just as the sun was setting in front of us. It was along this stretch of limited visibility that Leonora yelled ‘LOOK OUT’, I was unsure what I was looking out for but heavily applied to breaks and moved towards the middle of the road. Turned out there was a wild camel sitting on the side of the road, which I was unable to see due to its sandy colour and the sun in my eyes. It was not until the camel started to stand up that I saw it. These things animals are huge and could quite easily make a real mess of a truck let alone a 4WD. Fortunately the beast lurched to its feet and run up the bank into the scrub rather than across the road, it must have been close. After returning to the black top for the remaining 100km back to Kings Canyon Resort we spotted another 3 camels in a group as they meandered across the road well ahead. Figures! We had been looking for wild camels for the last few days and as soon as the sun goes down we find 4 in less than an hour. Leaving Alice Springs today we headed to Kings Canyon. Rather than following the bitumen all the way we chose to take the 100km short cut over Ernest Giles Road, a dirt road that would save us about 140km. We of course ignored the ‘Caravans Not Recommended’ signage.The first 70km of the road was fine and uneventful, but the last 30km was heavily corrugated. Travelling the last section hovering around 20km/h was extremely painful, so much for a shortcut. We lost some of our crockery due to another overhead cupboard failing to stay shut. This evening we went for a short walk into Kings Canyon just before sunset to investigate the ‘Rim Walk‘ around the edge of the canyon. It was around 6pm and the thermometer at the information sign still showed 46 degrees. We took the Kings Creek Walk at around 1hr return. Well today I took stock of how much pain we had inflicted on the van over the last week of gravel roads. Other than the non-cooling fridge, most of the items are more annoying than disastrous. Thankfully the caravan park we are staying in also happens to be the largest caravan repairer in the Northern Territory. So today was spent screwing, fixing, removing and refitting where necessary. Leonora is not impressed at all!!! Today we pushed onto Alice, nothing really notable, just cover the miles and checked into the only pet friendly caravan park in town. It is nice to be back onto the black top again. Here we plan some stationary time, a bit of a holiday from the holiday so to speak. Dropping in at the visitors center this morning suggested that the planned route to Alice Springs via the Donohue/Plenty Hwy would take some time due to poor road conditions and ‘high clearance 4wd only’ signage. Along the highway we came across a huge ant mound, while there where many large ant mounds scattered around the bush, this one right beside the road was massive. We did not see any ants around, maybe they got sick of all the travelers having a gawk and moved on. Pulling in to refuel at Jervois homestead I found a sign made up of stick on letters, most of then had long gone missing. It contained two lines, the first I made out to be something along the lines of ‘press button for service’, the second line was still unclear… but as soon as I pressed the button, the thundering noise the horn made me jump a foot or two into the air… now the second line is obvious ‘warning horn is loud’. We spent the night at Jervois homestead just beside the dry Marshall River, quite a nice spot which even had showers at a minimal fee for campers. A Land Down Under is powered by	WordPress 3.4.1 and delivered to you in 0.552 seconds using 39 queries.